Frustration rummy is a clever twist on the popular card game known as rummy. 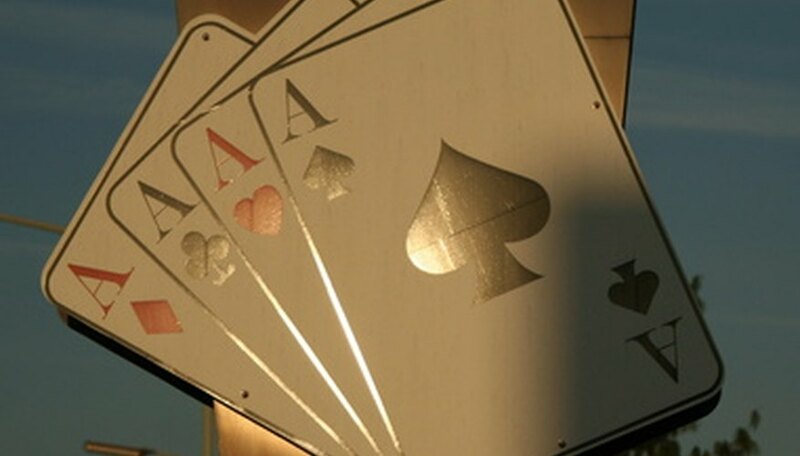 Although very similar in game play to regular rummy, as most of the play revolves around players picking a card from a deck, playing a set and discarding, Frustration rummy is so-called because players can only lay down cards according to a series of contracts that must be followed precisely. Frustration rummy can be played with a regular deck of playing cards and with up to four players. Prepare the deck of playing cards for Frustration rummy: the deck should only contain aces, numbered cards two through 10, jacks, queens and kings for all four suits. Agree on and list the contracts that must be followed by players while playing Frustration rummy. A player wins the game by achieving these contracts in order. For instance, the first contract players may have to achieve is two books of three, such as laying down three fours and three kings at once. Next, players may have to achieve a book of three and run of four, then a run of seven, and so on. Shuffle the deck thoroughly and deal cards to all players. For two-player games, deal 10 cards to each player; for games with more players, deal seven cards to each player. Place the remainder of the deck face-down in the middle of all players, turn the top card face-up and place it beside the remainder of the deck. Pick up a card from the deck or discard pile, and discard a card to the pile. Play will always start with the dealer and continue to the left. If you can achieve a contract or a set, lay it down before discarding your next card. You can hold off on a set if you're trying to achieve a contract, and you can achieve a contract by playing off of another player’s cards. Continue play until one player loses all of the cards in their hand, either through playing a set or through the discard phase of their turn. At this point, a new player becomes dealer, the cards are shuffled and new hands are dealt. Play continues in this way until one player achieves every contract and the game ends. For an alternate scoring system, you can also add up the points each player earned during the round in a traditional rummy scoring style to create an additional level of complexity for Frustration rummy.